Remember the team who released an interesting hack for iPhone 3GS with name of “FaceIT3GS”which brings Facetime to it? 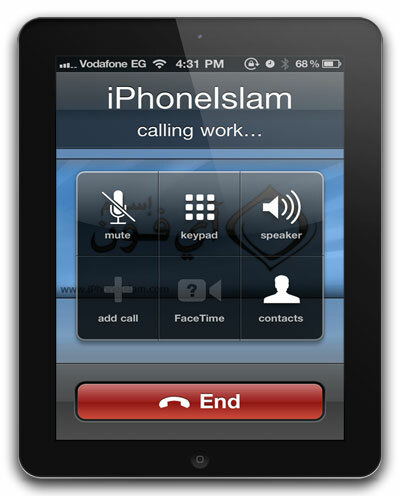 iPhoneIslam is the team who did that, and now today they come up with totally new hack on which you may not believe on first read, they are developing a hack which turns your iPad into a iPhone and provides you full calling and SMS support on the iPad 3G. By stock, iPad 3G only allows you internet connection and other special services via 3G, but no support of calls or SMS. They have just posted a quite blurry video which is used as a proof of their project. On video they showed their jailbreak iPad which uses the jailbreak tweak to unlock the feature of calling and SMS on the iPad. According to the team, the hack only requires a jailbreak iPad rather than any hardware accessory. A hack that will change the game. Can you imagine turn your iPad to a fully functional phone. As we have said you before, it’s hard to believe on the project they showed on YouTube Video, but the iPhoneIslam team has good record for this type of mods in the past.